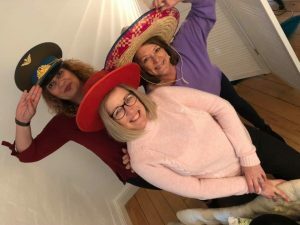 Friday 29th March 2019 was Wear A Hat Day 2019, an annual event to raise money for Brain Tumour Research, a charity we support as not only have some of our clients had brain tumours, but a friend of our died of a brain tumour a few years ago. The charity also has close links to Portsmouth so is local to us. Unfortunately, we couldn’t hold our annual Wear A Hat Day coffee morning due to other commitments, so we organised a cake sale within the building where our office is based in Waterlooville, on Thursday 28th March. Unbeknown to us, Stellar Despatch, another company with offices in another building on the business park where we are situated had planned a coffee morning and raffle on the same day to support Wear A Hat Day too, so when we swapped promotional materials we decided to combine our events. Soraiya Humby won star baker within our team for the amazing cakes she baked for us to sell and on Thursday morning we knocked on every door in our building selling raffle tickets and promoting the coffee morning, with a promise of coming around again after lunch selling Soraiya’s cakes. We popped over to Stellar Despatch for a coffee during the morning and then both companies did a Facebook Live broadcast of the prize draw. 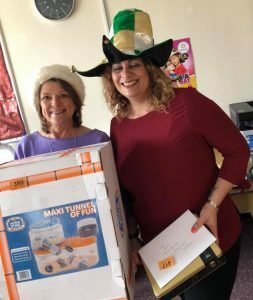 There were some great prizes and we were amused when Kate managed to select the hamster cage for a raffle prize and them drew her own name out of the hat. After the draw it was back to our building to knock on all the office doors to sell the cakes. We’re really pleased to be able to say that between us, Stellar Despatch and Clarity Care Consulting raised over £400 for Brain Tumour Research. Tim Green, the local coordinator for Brain Tumour Research, was able to visit our offices later that day to meet with us and Adrian Knight from Stellar Despatch for a photo opportunity and to receive the money we raised.